Designed and produced by International Paper, ecotainer® was created to reduce the impact its products would have on the environment. It was a change from the traditional without having to give-up any functionality. Using renewable resources from the USA, sustainable wood fibers and plants, ecotainer® was created. 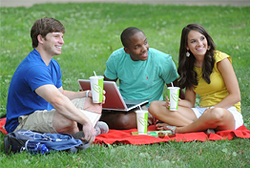 The product line includes hot and cold cups, food containers and lids. All paper products are lined from Ingeo™, a Natureworks® biopolymer derived entirely from domestically grown plant resources, not petroleum. This lining is FDA-approved. We use only tree fibers that are sourced in the USA and have through a system which adheres to SFI® (Sustainable Forestry Initiative) guidelines for forest management and harvesting. Tree from old growth or endangered forests are NOT used to produce ecotainer® cups. The water-resistant lining are found in the ecotainer® lids, as well. This lining is made from a bioplastic by NatureWorks, LLC, called Ingeo™. The materials to make this bioplastic are annually renewable and require much less energy to create than other polyethylene found in most other packaging. Over two-thirds of the energy used in the process comes from renewable resources. The paper used to make the ecotainer® cups goes through a elemental, chlorine-free bleaching process. The lining found in traditional hot and cold cups made the products unable to meet the requirements for compostability. However, Ingeo found in the ecotainer® product line meets the standards set forward by ASTM D6400 for compostability. Certified by Biodegradable Products Institute (BPI), ecotainer® cups and lids will decompose in a managed commercial or municipal composting facility. ecotainer® is also recyclable. These containers can be accepted by municipalities that can recycle poly-coated paperboard and packaging. Companies have worked with local recyclers to allow ecotainer® products into their, already existing, office paper waste stream. Composting means less waste in our landfills. But, despite ecotainer® making products that can biodegrade, many of them end up in landfills anyway. There are many other benefits such as they reduce greenhouse gas emissions, help eliminate petrochemicals, and enable other material recovery options. Consumer surveys and market research conducted by International Paper indicated that consumers could not tell the difference between “standard” cups and containers and ecotainer® products. Expressing a strong buying preference for packaging that had an improved environmental story, they were willing to pay a small premium for this packaging — all other factors held constant. Individual consumers in the United States alone use about 50 billion traditional paper cups and almost 60 billion plastic and foam cups every year. Retailers and manufacturers that make the move to selling and producing more eco-friendly packaging can impact these statistics by giving consumers what they ultimately prefer. At the same time, these single consumers will impact the direction taken by retailers, and ultimately by packaging suppliers like International Paper. 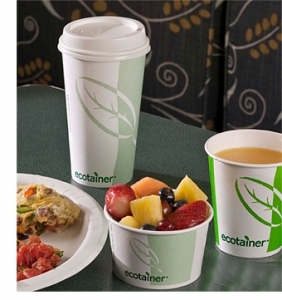 Hot cups and soup containers from ecotainer® can be custom printed in up to 4 colors with water based, CONEG and FDA approved inks that are safe for the environment. Contact your BioMass Packaging salesperson for more details.